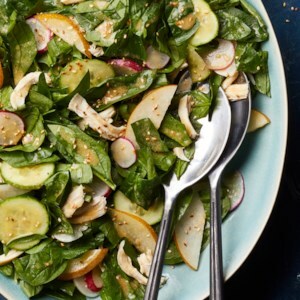 Find healthy, delicious main dish salad recipes, from the food and nutrition experts at EatingWell. 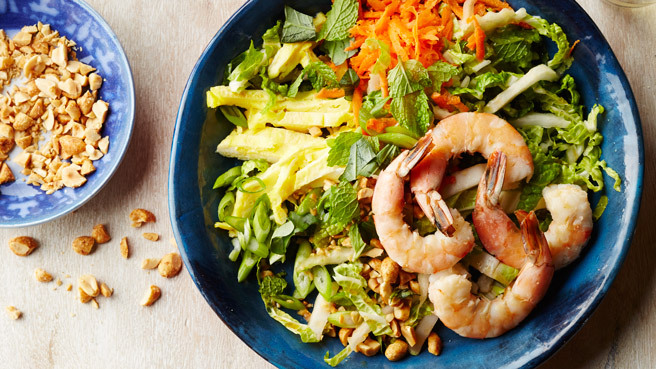 Slash calories, not flavor and turn pad thai into this healthy salad recipe by swapping sliced cabbage "noodles" for traditional rice noodles. 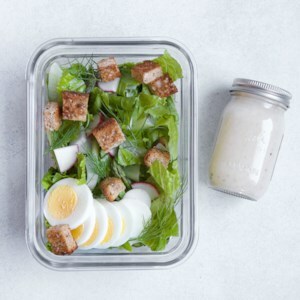 Grilling romaine lettuce and chicken breast adds smoky flavor to this chicken Caesar salad recipe. 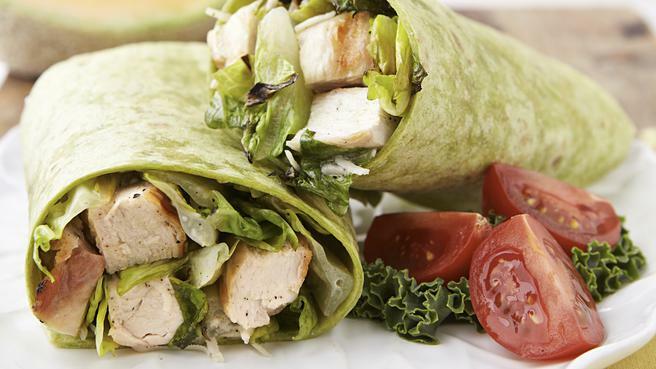 Toss with an easy Caesar salad dressing and wrap it all up for a delicious lunch or easy dinner. 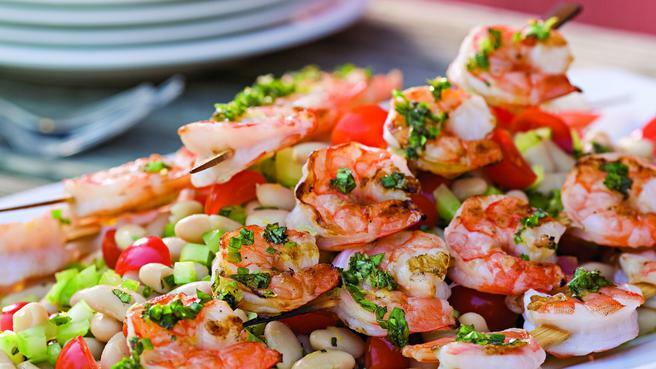 Fresh herbs make all the difference in this light, summery bean salad that in turn makes an aromatic bed for the easy grilled shrimp. 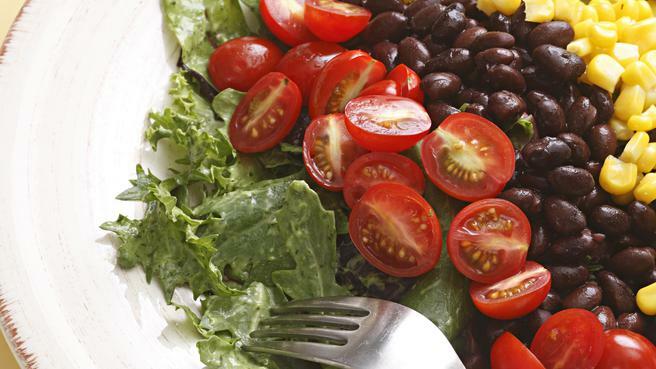 Top salad greens with black beans, sweet corn and grape tomatoes and drizzle with a tangy avocado-lime dressing for a Mexican-inspired salad. An unexpected combination, but one worth trying! 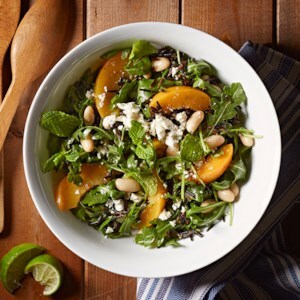 Peaches, feta, and arugula add some pizzazz to your rice. 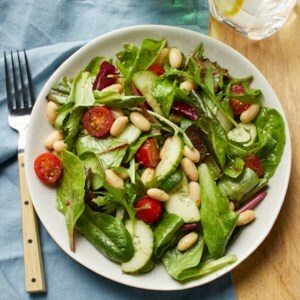 This no-cook bean salad is a delicious way to use summer's best cherry or grape tomatoes and juicy cucumbers for a light dinner or lunch. Fresh basil elevates an easy vinaigrette recipe that dresses up this simple salad into something extraordinary. 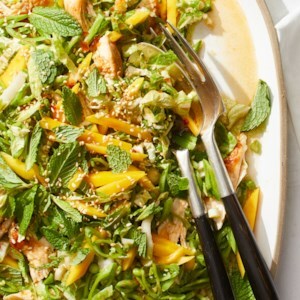 This Asian-inspired dinner salad has terrific crunch, thanks to sugar snap peas and napa cabbage. 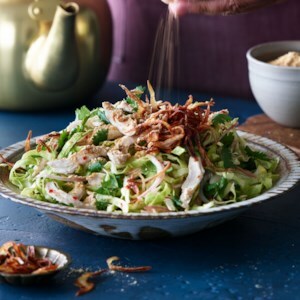 Give the dressing a kick of heat by adding a bit of sambal oelek, an Indonesian hot sauce that you can find in most large supermarkets and Asian grocery stores. 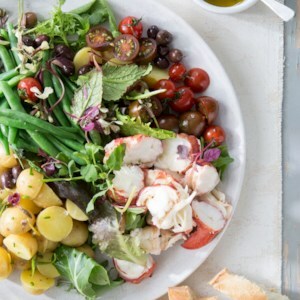 Steamed lobster is a luxurious swap for tuna in this otherwise-classic, veggie-loaded Niçoise salad. In a pinch--or if you don't want to deal with a giant pot of boiling water on a steamy summer day--many supermarkets have freshly picked lobster meat at their seafood counter or in the freezer case. 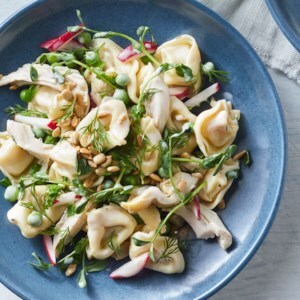 Serve with a warm baguette for lunch or dinner. 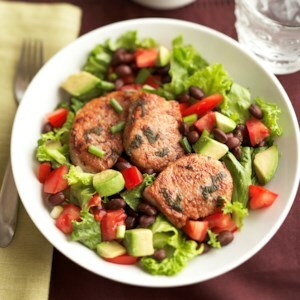 Avocado and black beans pump up the nutrients and fiber in this main-dish pork salad recipe. 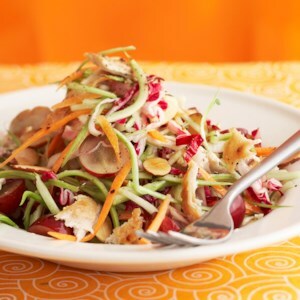 Rich in vitamins C, A and K, broccoli slaw mix makes this salad nutritious as well as super easy to prepare. 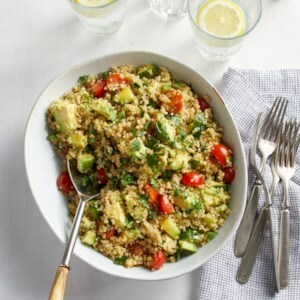 Protein-packed quinoa pairs with creamy avocado in this refreshing grain salad. 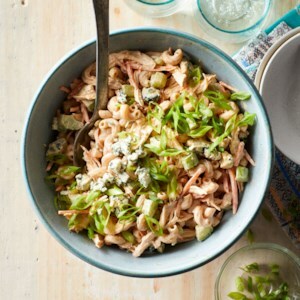 It's the perfect make-ahead side dish to bring on a picnic or take to a potluck. Or pack it for lunch or enjoy it as a light dinner. 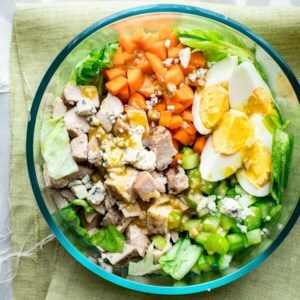 This single-serving recipe for Cobb salad swaps chicken in for bacon, which makes it a great source of protein for lunch. If you prefer another salad dressing, feel free to use that instead of our honey-mustard vinaigrette. 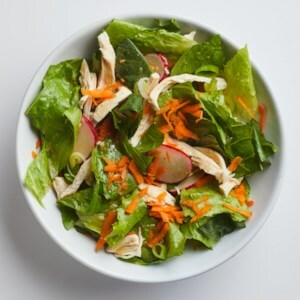 Swapping out mayonnaise in favor of lime juice and shallots is a simple change, but its impact gives this healthy chicken salad recipe a light, fresh feel. For more color, try swapping in a bit of red cabbage for the green. 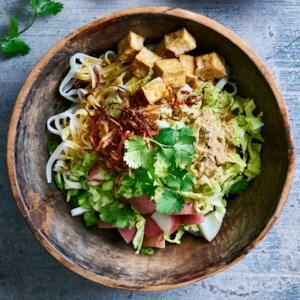 We've kept it simple with just rice noodles in this healthy vegan noodle salad recipe, but if you want to go wild, use wheat noodles, glass noodles or even your favorite spiralized veggie noodles. 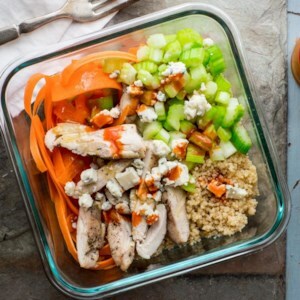 Keeping cooked chicken and prepared sesame-ginger dressing on hand means this healthy lunch salad comes together in a snap. 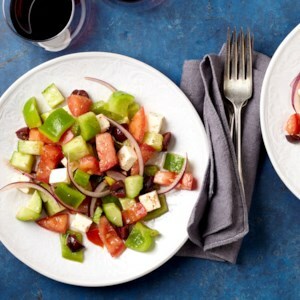 Called horiatiki, this lettuce-free salad made up of tomatoes, cucumber, bell pepper, onion, olives and feta is one of the most popular Greek dishes. It is traditionally served with bread, not pita. 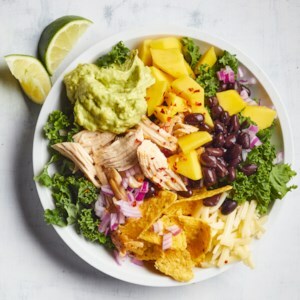 Make this satisfying salad in the evening and enjoy one portion for dinner, then pack the remaining portion for lunch the next day. 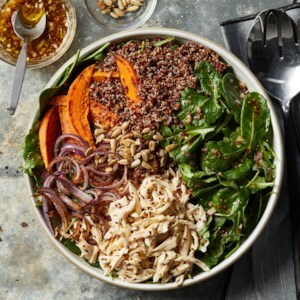 Loaded with protein- and fiber-rich ingredients like chicken, sweet potato and quinoa plus power greens, this meal is nutrition-packed! 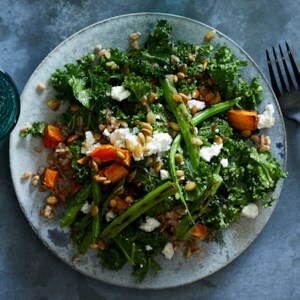 After a good charring in the skillet, kale stems add a tender-crisp bite and touch of smokiness to this healthy vegetarian kale salad. Feel free to use this healthy recipe as a guide; swap out the farro for any whole grain or the squash for any roasting vegetable, such as cauliflower.